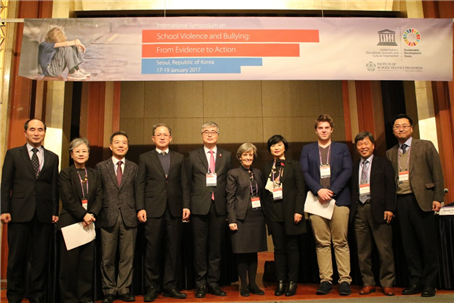 Institute of School Violence Prevention at Ewha Womans University hosted an International Symposium on School Violence and Bullying: From Evidence to Action, at Lotte Seoul Hotel in Seoul, from January 17-19, 2017. 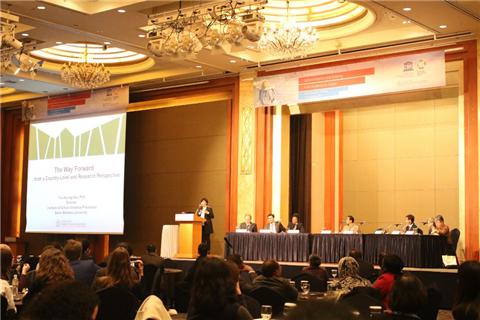 The symposium was co-organized by UNESCO Paris and financially supported by the Ministry of Education of the Republic of Korea through the National Research Foundation of Korea Grant. The International Symposium brought together 250 people from 75 countries, including teachers, learners, ministers and vice ministers of education, senior government policy officials, UN and bilateral agency representatives and other development partners, civil society, the private sector, and school communities. Participants included Mr Joon Sik Lee, the (former) Deputy Prime Minister and Minister of Education; Mr Gwang-Jo Kim, the Director of UNESCO Office in Bangkok and Regional Bureau for Education; Ms Marta Santos Pais, the Special Representative of the United Nations Secretary General on Violence against Children, UN; Ms You Kyung Han, the Director of Institute of School Violence Prevention at Ewha Womans University; Ms Christina Salmivali, a Professor at University of Tulku, Finland, etc. The International Symposium represents an important opportunity for the international community to respond to the UN Secretary General’s report on protecting children from bullying and cyberbullying, presented to the UN General Assembly in October 2016. Specifically, the symposium concentrated on the overview of the nature, extent and impact of school violence and bullying, the synthesis of available evidence about effective responses, highlighting existing initiatives and examples of good policy and practice, and the suggestion of the guidance on priority actions, in order to promote evidence-based action to prevent and intervene school violence. Throughout the conference, the unique mix of participants shared the common vision of safe and non-violent learning environments for all children and young people. ​A Global Status Report was released at the Symposium, providing most up-to-date available data on the extent, nature and impact of school violence and bullying and providing education sectors with a framework for planning and implementing effective programmes to respond. According to the report, the result of analysis on the data from 19 low- and middle-income countries shows that 34% of students aged 11-13 reported being bullied in the previous month and 8% reported daily bullying. In addition, a 2016 opinion poll on the experience of bullying shows that among 100,000 young people in 18 countries responded, 25 percent reported that they had been bullied because of their physical appearance, 25 per cent because of their gender or sexual orientation and 25 per cent because of their ethnicity or national origin. Institute of School Violence Prevention is a professional research institute dedicated to promoting safe school environment through engaging in the design, implementation and evaluation of program and policy for school violence prevention. The institute has been funded by Research Grant from National Research Foundation of Korea from 2012 to 2021.